You provide a budget and a list of zip codes and our expert team will deliver the results you desire as a real estate entrepreneur: an abundant supply of prescreened, motivated sellers! We are the only company that gives you the managed systems, trained shared resources and proven processes that allow you to focus on the money making activities of closing deals. Not a direct mail house: Although we'll do all your mailing and lead generation for you at the cheapest guaranteed price, without lifting a finger. Not a virtual assistant agency: Although you'll have a team of VA's doing all your work and you never have to manage a single one of them. REIvault is unique in that it provides the best of each of services above in a single solution that shares managed resources and a team of professionals that generate leads and appointments with motivated sellers like a well-oiled machine which means you get to focus on what you do best... closing deals with motivated sellers or getting listings from these leads as an agent. Answer This: "Do You Want To Be A Professional MARKETER... Or A Professional INVESTOR?" Ask Yourself: What's My TIME Really Worth? Whether your business is large or small, you should act like the CEO you are. Your time is best spent talking to motivated sellers, solving their problems and either buying or listing their house for them. We love building the machine that makes the phone ring. We're great at it and we can do it faster, easier and cheaper than most investors can do on their own. ​So why should you reinvent the wheel and work on lesser tasks when you don't have to? Many real estate investors and agents who work with us already have systems, teams, assistants and processes to create leads and turn them into deals. But they see the value in leveraging OPR (Other People's Resources) to maximize their efforts. That's why they turn to REIvault. Onboarding a new member happens quickly and easily and within 7-14 days, leads and appointments with sellers are being generated for you. First, we help you determine the amount of deals you're looking to close per month in a given geographic territory and then we suggest a recommended marketing budget based on statistics used with over 250 investors generating 150,000 seller leads per year. When we are in alignment on how many deals you're looking to close per month, we go to work with your marketing budget and our team. Behind the scenes is a well-oiled team of managers and virtual expert assistants that we have hired, trained and manage to make certain that the proven systems create predictable results month in and month out. This involves us pulling lists, deciding which marketing materials to send for best results, working with our mail-house and responding to incoming seller calls using a proven script that helps determine seller-readiness and motivation. 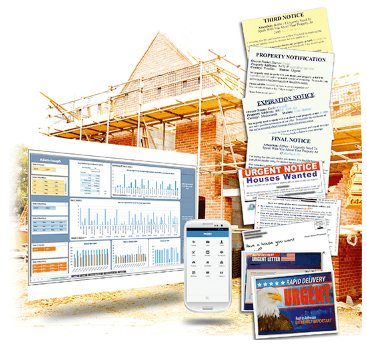 We then deliver a consistent supply of qualified “appointments” (not just leads) with pre-screened, motivated and ready sellers that you can close. This is accomplished through the use of highly-responsive direct mail marketing campaigns with postcards and letters with marketing copy that is proven to generate leads. Then our phone team of Sales Ninja's goes to work qualifying and screening the leads for motivation, readiness to sell or hear an offer and gathering information on the property. Next, each lead is entered into a simple but robust custom PODIO CRM where are investor-members access to view the leads they received and any notes from the phone team. (Sometimes our investors have their own phone and acquisitions team in place to handle this part, which still fits perfectly with our system). If sellers aren’t ready for an appointment after the first call, they enter our automated... “No Seller Left Behind” follow up system which automatically sends them letters, postcards, text messages and Sly Broadcasts every month. This follow up system has been the single most effective process at turning cold leads into hot deals. Because of the amount of work involved in setting up a proper follow up system, many investors ignore this and miss out on 80% of the deals they could have closed if it were in place. This is almost completely hands-off, set-and-forget for our investors. Consistent improvement keeps deals flowing in. Every month we assess what worked best for your business and make any necessary adjustments, which might mean the source of leads or helping you better work with the leads your given. Often, the biggest return on investment comes from our ongoing training and support that helps our investors get better at negotiating and closing deals when they get qualified sellers on the phone. 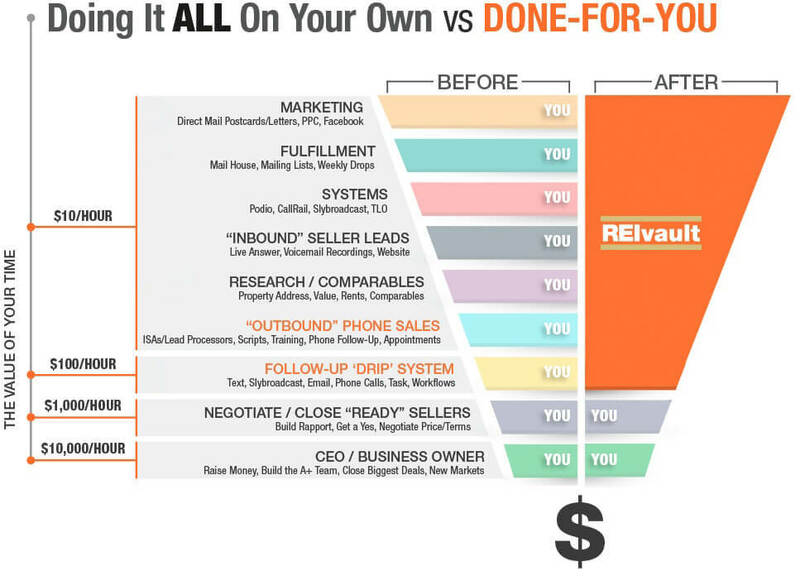 The bottom line is that REIvault relieves the burden of building and managing a full scale marketing and sales department by sharing the systems, resources services that we've built and utilize for our members. Postcards for as little as 36¢ and Yellow Letters for as little as 50¢ or less AND can include phone number, minutes, voicemail transcription, & text messages. We're not only the biggest direct mailer for real estate investors, we produce more leads than any other investment company. And if we can't do it for less than your mail house, we'll use them. Getting leads to call is only half the battle. What happens on the phone, to qualify and create rapport is what closes deals. But handling every phone call yourself can be an exhausting waste of time. That's why we build the Sales Ninja Phone Team to serve as your own professionally trained and experienced team of "inside sales agents." Our Sales Ninja Phone Team professionals are highly trained and scripted. They cover all time zones 24/7. Imagine the results you'll get from having a dedicated team that is continuously calling, screening, qualifying, appointment setting, and following up on all your leads. Plus, it's all automated and managed for you. We have found that 80% of deals close between the 5th and 12th contact with the seller. Our Sales Ninja 'Drip' Follow-up Campaign System automatically keeps your offer in front of them long after other investors have stopped following up and is responsible for more closed deals with less effort. All sales copy and content is pre-written and proven! deals with less effort than ever before. "We had an almost immediate return on investment!" "....setting up the mail packages was costing me around $10 or more and about 20-30 minutes time... now I just push a button...saving time and saving money..."
"What happens after I become a member?" "...the majority of these sellers that are calling, we're the only piece of mail that they have received.... that's really helped us have an advantage.... it's really surprised us"
"On track to make six figures off of this first mailing." "It just flat out works...I can focus all of my time on making deals." "It has gone beyond my expectations"
"I am so happy and so glad I made the decision to do this because it has gone way beyond my expectations. ...."You have theprogram. You got the phones ringing, There's no doubt about that." "I couldn't even imagine taking on the things that you guys are doing, we're leveraging your horsepower to make our marketing that much better"
"Sorry to bother you man. But I wanted to let you know that the list you guys have is almost as good as Chick-Fil-A lemonade. I never had a list where the sellers call you wanting to give you their house and first born. I'm not a big course or program buy. But there can't be possibly be a better program than this Rei vault. I've made 6 figures off your list alone this year. Man, you have totaly transformed my business. I was totally lost without you and didn't even know it." REIvault is a game-changing resource for me. It serves as my entire back-office marketing department and allows me to focus solely on talking to motivated sellers without worrying about pulling lists, stuffing envelopes, generating leads or worrying if I'm missing out on deals. If REIvault was around when I started investing in real estate over 10 years ago, I would have ﻿flipped 10X the number of houses by now! "Before we started working with you, we were the model of inconsistency... Our revenues reflected it... what really pushed us over the edge. ...The concept if let's leverage into what other people are doung and it's only going to continue to get better as the community grows ...We locked up a deal on the very first mail drop... we're expecting as that pipeline builds that ROI to get bigger and bigger." "You just login each morning and you've got new leads there." "If you're trying to do marketing without a system you're kind of crazy." "It's the best investment I've made when it comes to my Real Estate. ""It's great that I get home, I can open my laptop and I already know what I need to do, which is talk to the sellers... ...the VAs do a phenomenal job, getting the information, pulling up the property information, so even before I talk to the seller I have everything in front of me... so when I'm calling these people I already know where I need to be from a price standpoint .... I'm focusing on talking to sellers, talking to buyers, and putting deals together.... You still have to work, you still have to put the deals together, but Cris and Gary just make it really easy." Trying to determine if a new resource is right for you can be challenging. That's why we answered a few of the most frequently asked questions below. Simply click on the grey box below and the answer will appear. Then click the button at the bottom of the page to set up a time to speak with us. How do I know that your lists are any better than mine or another company's? First, although we have proprietary, exclusive and effective lists to market to, you are free to bring your own list sources and we'll use them as well. However, our multiple sources have been so effective, many investors and agents simply let us do what we do and focus on closing the appointments we bring them. I already have a team, why do I need you? Many of our members had (or still have) their own teams in place when they decided to work with us. Although we are able to replace most of the sales and marketing support you have, it's not necessary. Because we serve as a fully managed profit center that simply delivers appointments with motivated sellers, you're free to compare our results and cost per appointment with your own team and decide if one works better for you over time. The biggest advantage however is that with our team, you don't need to find, recruit, hire, manage, fire or replace anyone ever and because of this, your business is protected from someone on your team disappearing. This means you'll sleep easier at night knowing that you have everything covered. How long do I have to commit to membership? The majority of our members have been with us for years, seeing REIvault as an integral member of their team. However, there are no long term commitments to joining our ranks and testing our systems, resources and results. This is not a year-long commitment. In fact, if after just One Quarter, you feel as though we aren't helping you close more deals with less effort, you're free to part ways. ​However, due to the nature of the sales cycle, we do ask for 90 days to see the full results. How does this compare to a software that automates all my follow up? Software platforms are great tools. We custom built a Podio system that all our members use with very little learning curve. However, software is still just a tool. Someone on your team still needs to learn it and manage it for you. Or you have to do it yourself. Our system is full managed and easy to navigate. You don't want to spend your time inside software, you want to spend it talking to motivated sellers and negotiating the best deals, right? What do most investors/agents like most about REIvault? Our members tell us their favorite part of working with REIvault is the fact that we deliver on our promises. We deliver appointments with motivated sellers while giving them back the time and energy needed to generate them on their own. If I'm just beginning to invest and don't have a team or a lot of experience, is this right for me? For newer investors, this could be perfect because you don't need to build the systems from scratch on their own. However, this does require a significant investment. And because leads will start showing up in as little as a week, you need to be willing and able to talk to sellers, negotiate and close deals. If you feel confident in your ability to do that, given the right amount of support, this could be a good match for you. The learning curve is short. We have a members only portal filled with training and fast-start materials that allow you to quickly learn and adapt our methods to your business. Since most new members start seeing leads in as little as 1 week, we had to ensure that they are up to speed as quickly as possible. How many people do I have to manage? Zero... That's our role. We built the team and we manage it like a well-oiled machine. You'll never have to interface with anyone besides your client success manager and our management team. We have you covered. No more recruiting, hiring, managing, firing or replacing assistants who don't work out. Because each investor comes to us with different resources already in place, we offer multiple options for them to join our ranks, leverage our resources and generate results. We do not price our program based on time, leads or deals. We also do not take a percentage of each deal closed. Instead, we built a fully functional team that can do everything promised and our members invest the approximate cost of hiring one (1) full time assistant making minimum wage. In fact, one or two closed deals per year could easily pay for 12 months of working with us. Plus the investment is far less than the average industry mastermind or coaching program that simply tells you what to do and sends you off to figure it out on your own. As such, since our primary mission is to deliver you qualified, motivated appointments with motivated sellers, most of our investors realize a significant return on investment since they know they can close deals if they're talking to the right person. What Is My Long Term Commitment? However, there are no long term commitments to joining our ranks and testing our systems, resources and results. This is not a year-long commitment. However, smart investors know that because the fortune is in the follow up, the majority of leads don't turn into deals until after multiple contacts and that usually happens in the first 90 days to see the best results. Active, serious or committed investors who are are currently marketing for motivated sellers in their markets. Investors who understand how to talk to motivated sellers when put on the phone with them (our systems and services guarantee a large amount of seller leads and ideal members are comfortable talking to sellers). Investors who are tired of working “in” their business instead of “on” their business. If you are brand new to real estate investing, have never done a deal and don’t actively market for motivated sellers now, we may not be a good fit because the key to getting a good return on investment is the confidence you have to close appointments with motivated sellers. If you lack experience but have confidence you can close deals, feel free to apply and we'll see if it's right for you. Investors with zero marketing budget or resources to invest in lead generation and business systems. This is for investors who understand it take money to make money and are willing and able to invest in marketing for deals. Scarcity-minded or know-it-all investors who wish to micromanage every aspect of their business and refuse to accept guidance. Investors who are unwilling to collaborate with non-competitive members inside REIvault, sharing what’s working best and helping others by sharing their knowledge. How Do I Join REIvault And Leverage The Team & Resources For My Business? Since REIvault is not a marketing agency or a mail house, it's not possible to simply hire us. We are a collective of real estate investors sharing services, resources, systems and best practices. Additionally, we operate with semi-exclusive geographical territories so we ensure that investors aren't competing with each other in the same market. For these reasons we have a simple application and zero-pressure interview process as outlined below. You like what you've seen in our (on demanding) training, listened to our success stories and read through the FAQ's and it looks like becoming a member of REIvault can add massive value to your business. Simply schedule an appointment and we'll answer any remaining questions you have while we determine if there's a mutually beneficial fit. After you schedule your appointment we'll ask you a series of simple questions about your existing business to best prepare for our call together. On our call, we will review your application together and answer any questions you may have about REIvault. We'll share our insider knowledge of the real estate market and help you analyze your current business model and marketing budget to determine the best strategy for success. Finally, we discuss your level of contribution to the group and the value of helping each other grow and prosper. Important: We will not try to persuade you to join REIvault unless we feel it's a mutual fit. You'll receive zero high-pressure sales tactics or manipulation. We invest an extraordinarily large amount of time, money and resources for every new member and it's important that we feel having you onboard will be as good of a return on investment for us as we are for you. Upon mutual acceptance of your membership, we will give you access to the private members portal with the Fast-Start onboard training, assign your client success manager and begin building out the resources for your specific campaigns. We will walk you through every step to ensure you understand how it works and how to best work together. You can expect leads to begin rolling into your account in approximately 7 days from this point. We'll be at your service to answer any questions and get you closing deals quicker and easier than ever before.